Vote forMargaret River, WATop Regional Destinations Which are Australia's must-visit destinations? You help us decide. The name given to both a town itself and the greater region of the area, WA's favourite getaway spot, Margaret River, is one of the true hidden travel gems not only in Western Australia, but the country as a whole. Featuring a diversity of nature intermingled with some excellent wine country and beautiful coastline, it's a place where rocky shores, wondrous cave networks and quality culinary offerings all meet. The Margaret River region – which lies roughly a 3 hour drive to the south of Perth – provides a blend of natural environments that offers outstanding variety; lush vineyards contrast with rugged stretches of coast offering the chance to get out on the open water and experience the likes of surfing, fishing, and some great whale watching during these gentle giant's annual migratory period. Couple this with dense heartland forest on shore offering a dose of greenery, individual sub-regions such as Augusta, Busselton and Dunsborough each with their own distinct charm, and famously friendly locals always willing to lend a hand and provide advice on regional goings-on, and you've got a wonderful overall balance to this part of Australia – there's no wonder why it's a favoured escape of Perth residents all year round. It's also the site of one of Australia's 10 Most Epic Walks, the incredible 'Cape to Cape' coastal walking track from Cape Naturaliste in the north to Cape Leeuwin in the south. All things gourmet have also long been a staple drawcard of the Margaret River region, stemming from its beginnings as a minor dairy producer and expanding today into what is an area with numerous culinary delights to take part in and enjoy – its restaurants, cafes, breweries and wineries are of an almost universally high quality. This culinary bent is particularly highlighted by wine, and what an array of offerings the region has – both the climate and the soil conditions of the Margaret River region lend themselves to excellent grape-growing circumstances, and as a result over 95 individual wineries call the area home today. Those who enjoy a drop of the good stuff will be in their element here, as there are multiple excellent wine trails available for sampling the various Shiraz, Chardonnay, Cab Sav and other wines that are a staple here. The Margaret River region is an area where each of its highlights compliments the other nicely; you can enjoy some indulgent food and wine, and then burn off the calories by taking any number of opportunities for outdoor exploration. Stroll along the picturesque coastline, then get out on the water and see the migratory humpback whales up close. Flexibility is the name of the game here, and every visitor has the chance to make their Margaret River experience their very own. Looking to pay a visit to Margaret River but not sure what to do? Here are some of the most essential experiences. What's new in Margaret River in 2017/2018? The Gourmet Escape Food Festival continues its status as the premier food festival in Australia, attracting 50-odd of the world's most famous chefs. Conde Nast Traveler named Margaret River one of the best places in the world to visit during the month of November each year. Need more info on Margaret River? Check out our detailed travel features on this top spot below. The Margaret River region is bursting with things to see and do. Here we break down the top 10 things to do to help you plan your trip! 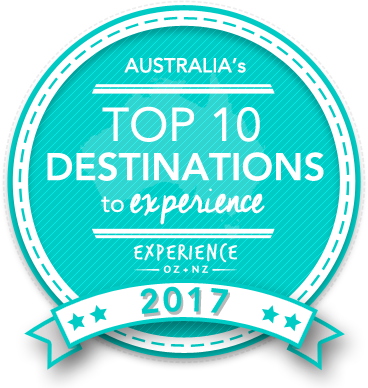 Is Margaret River Australia's Top Regional Destination to Experience for 2017? Vote now for the chance to WIN an epic trip to one of Australia's top destinations!